It’s with great pleasure that we can bring a B4YS update, which includes the amazing news that 152 properties in Silverdale are now enjoying 1,000 Mbps B4RN fibre! That’s of course on top of the 179 in the Yealands which are alreadyconnected up and taking the service. 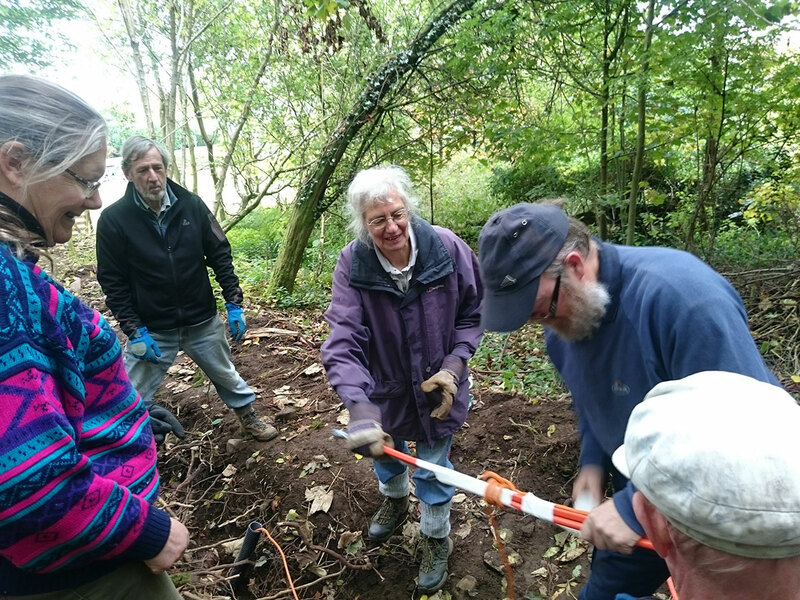 On Saturday 16th September B4YS has been invited to talk about our part in the ongoing story of Silverdale during an event organised by the Landscape Trust, a charity with over 1100 members supporting the AONB. The Silverdale Story will be recounted over four days, with free events, talks, walks, tours, workshops and exhibitions, from Thursday September 14th – Sunday September 17th. Our part of it will take place in the Parish Rooms between 3.00 pm and 5.00 pm. 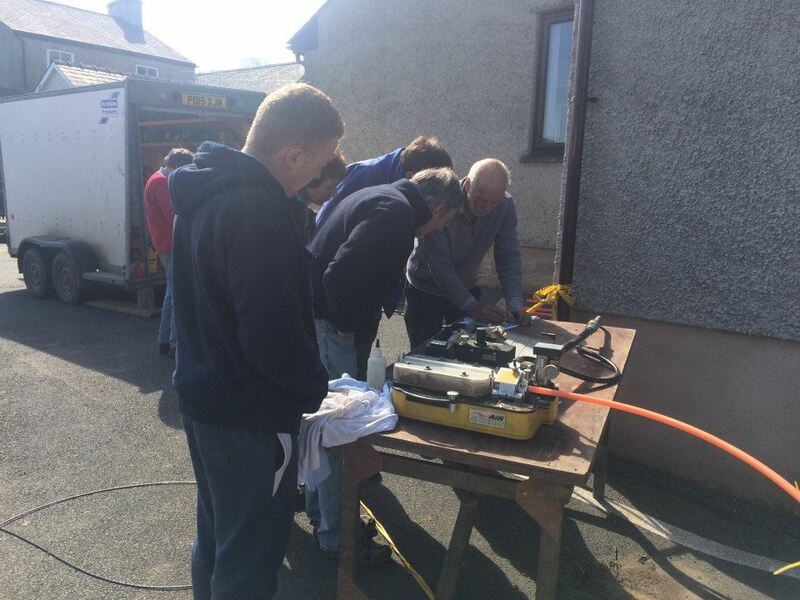 B4YS volunteers will be on hand to talk about, demonstrate and help devices connect to hyperfast fibre broadband. Find out more HERE. “Excellent progress to report after several unforeseen delays, nearly all down to the weather! 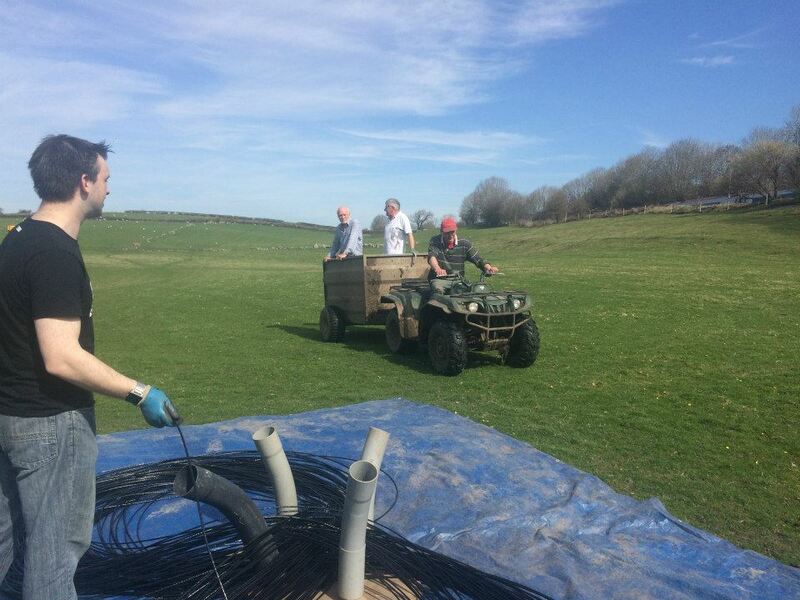 The B4YS fibre ducting has now left the Yealands and is making its way towards Storth, which is very exciting! 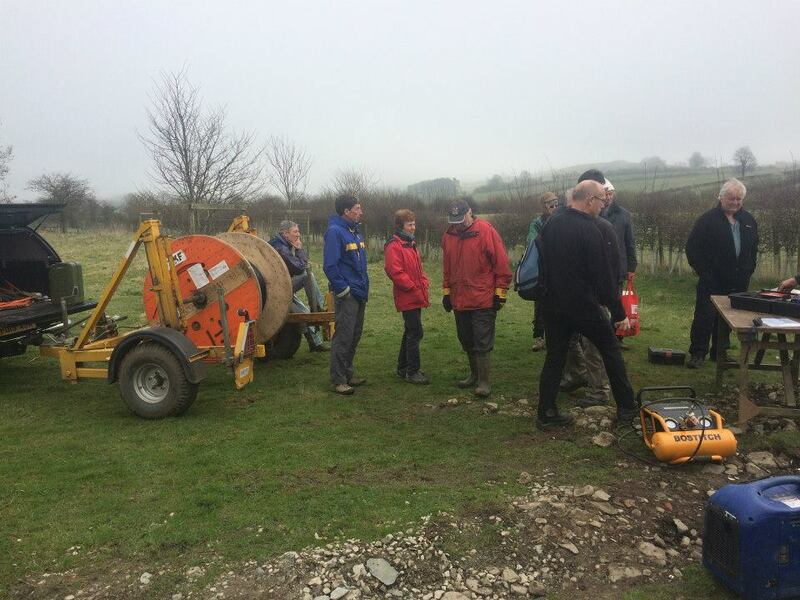 Before Christmas the Yealands team brought the duct to Brackenthwaite farm and this week, weather permitting, work will begin this week on a dig to our first Cumbrian property. This first dig will be a trial, where we’ll learn some lessons to apply to the next section. From there we’ll make progress as quickly as weather & tricky ground conditions allow. Whilst for some it might seem that it’s all gone a bit quiet in B4YS-land these last few months, for our volunteers it’s been anything but! 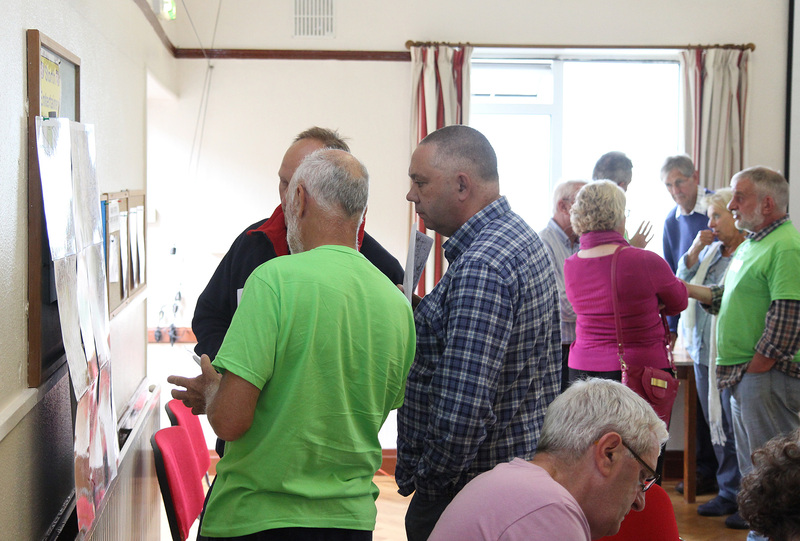 The B4YS project has moved into a different phase; whilst fundraising was very ‘public’ and involved the whole community, route planning & building is proving to be a much quieter affair with conversations involving small groups of just a few. Either out in the fields or around a kitchen table, important progress is being made and challenges are quietly being overcome. For those in the Yealands – who are first in our initially ‘Y’ shaped route – route planning has already turned into digging and even connections. In Silverdale, in some ways the most challenging parish, lots of planning work has been done in a story of “3 steps forward and 2 steps back”. For Storth, route planning has been constant and relentless; we feel this part of the network will appear to all fall into place at once. “Silverdale turned out to be a very challenging parish. Three routes into Silverdale have been ‘pencilled in’ and none have been perfect, each having pros & cons. Walking, researching and assessing three routes has taken an awful lot of time & effort from the committed volunteers. However, most of the necessary way leave agreements have been signed and we are now awaiting the final core route planning for the Silverdale part of the network being done by B4RN within the next two weeks. 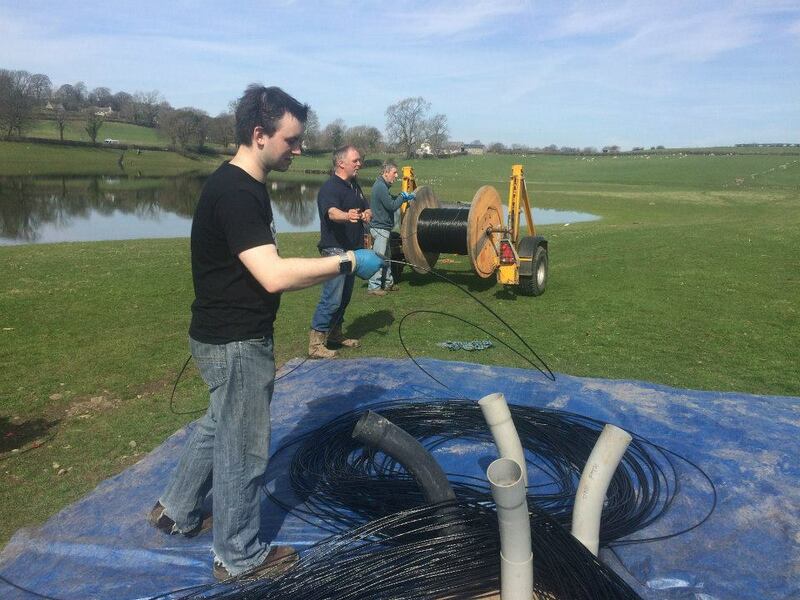 That will enable us to start work on installing the first cable ducts. Following helpful discussions with the vicar and the church council, we are pleased to report that the Silverdale hub will be located in the boiler house at St. Johns and fibres will be routed from there to individual subscribers. As soon as we have the first draft of the detailed roll out plan for the entire village we will invite shareholders and volunteers to a meeting to organise the work in detail. “Planning of the run up to Storth is well on the way, with all the major landowners being very helpful and supportive. They all have various obstacles and hurdles to overcome (Gas lines, electricity cables, sewers, field drains, etc.) and as we are also new to this, it gets delayed whilst we ask B4RN for help and advice. We have several wayleaves agreed, with others still being sorted, and at present everything is progressing as we would wish. 1st June. Lots more customers being added! The route heading for the Silverdale handover point, 2.5km of it blown today and more houses added on. 2nd August: Nice email just in, describing a livestream from the church at Yealand. “Here is a brief resume of what was achieved at St John’s church using B4RN:- St John’s Church , Yealand made use of its newly installed B4RN to stream a funeral service live to Australia. Family members living in Sydney were unable to come to the UK to attend the funeral. Instead, courtesy of an iPhone 6 and Face Time, they were able to view the entire service live from their living room. They commented that “it went incredibly well and it was really lovely to see – very special”. The church would like to be able to offer the ability to stream services such as weddings and funerals routinely and intends to investigate methods of broadcasting simultaneously to multiple viewers. Hope this is useful for your website! Vanessa Feltz meets her match, Chris Conder telling it like it is on Radio 2. Go Christine! The B4YS team would like to thank everyone for their continued support and most of all patience. For those not yet connected, hyperfast is coming and it will be worth the wait! 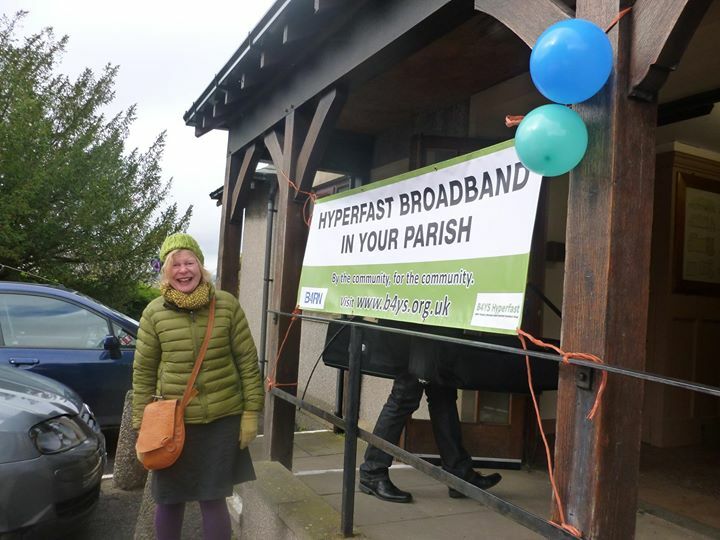 The Hyperfast Broadband service is now live in Yealand Village Hall.We completed the fibre blowing three weeks ago but we needed the B4RN technicians to connect us to the network. This work was completed yesterday. The hall is now connected, together with a few properties and business’s on the route from Tewitfield.The installation of the duct continues in Conyers, and is now well advanced. We are now waiting for permission for the road crossings from Lancashire County Council, which should be received shortly. We are making progress on the wayleaves through Redmayne and hopefully, work will start on the laying of the duct shortly. Fantastic news, we did it! Silverdale & Storth – you’re next! 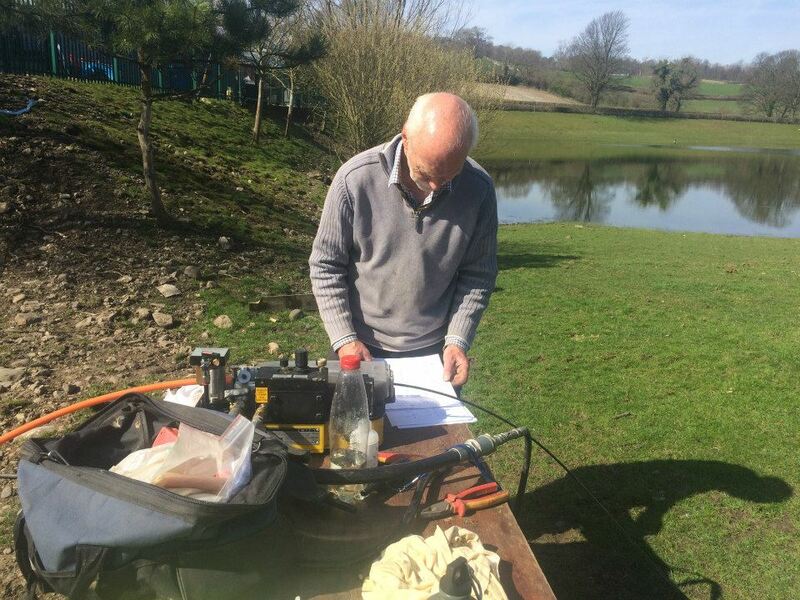 Bruce checking his sums… measure twice, cut once. And it was spot on. A nice tidy house install, hidden by the drainpipes, showing the gas block and house entry point. 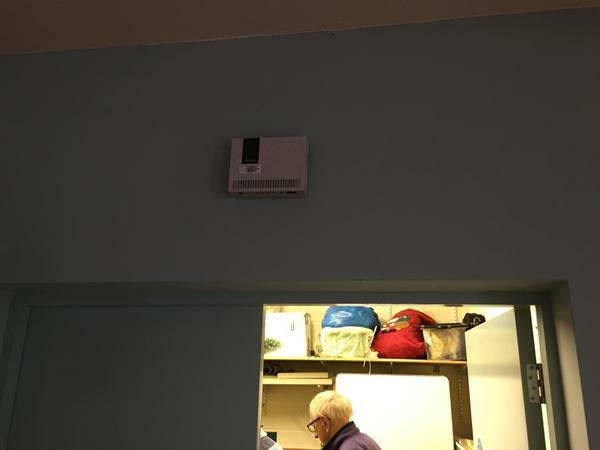 The B4RN router in Village Hall! 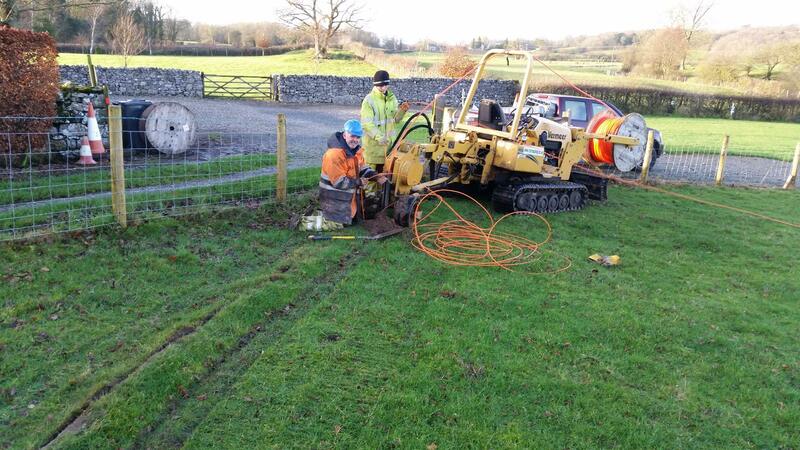 No doubt this means there will be a “demo day” in the Yealands soon, so more people can get hands-on with Hyperfast Broadband – watch this space for updates. For Silverdale & Storth, things are progressing in a positive direction, albeit quietly in the background at this time. Having Hyperfast just down the road in Yealands is a great step for us, it’s so close! Planning ~10 miles of route which accommodates all manner of obstacles is taking some time & effort, but we’re making good progress and going in the right direction! We’ll keep you updated. We have now completed the installation of the orange duct from Borwick through to Yealand Village Hall. 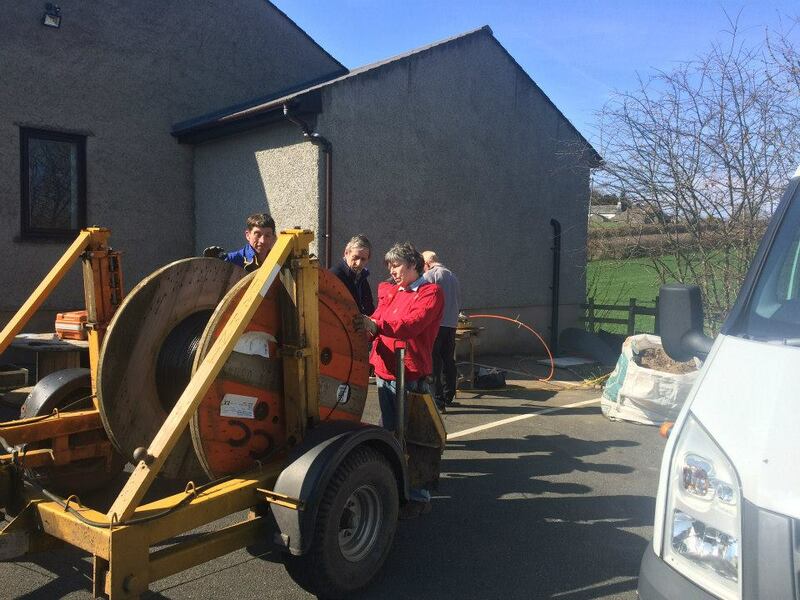 We will be blowing the fibre cables through the duct on Tuesday April 7th starting at 10am. We will connect the few properties on the route to the system, as we pass. The hub cabinet is now installed in the hall, with its own electricity feed. The electronics and computing equipment will be fitted in the hub by the B4RN Technician, as soon as the fibres arrive. We will arrange a Demonstration Day for all residents as soon as the system is live. This will give us a chance to try our various devices on the new Hyperfast broadband service. The installation of the duct through Conyers (which will go onwards to Silverdale) is progressing well. The west side of the village is completed all the way from the village hall through to Peter Lane. The properties on this part of the route have dug their trenches and laid out the duct. We are now starting the trenches on the onward section from Peter Lane towards Yealand House. The route for the east side of the village is finalised and wayleaves signed. We are mole ploughing the section from Snape Lane to the properties at the A6 junction, this weekend. Work on the remainder of the east section will commence in April. We are now close to finalising the route through Redmayne to Storrs (which will go onward to Storth). This has proved to be quite difficult and tricky. It is anticipated that we will start laying out the duct on the West side of the village in the next few days. There are a number of places in the villages where we need to cross roads with the duct. B4RN has applied to Lancashire County Council for permission to undertake this work, on our behalf. This should be granted in mid-April, after which we will commence the crossings. A contractor has been nominated. We are very grateful for the contribution of Tony Swidenbank and his team from TS Trenching in Kendal, for the laying of the duct in the Yealands. Tony uses a very sophisticated mole plough which does minimal damage to the land. It is difficult to see the track of the machine, after a few days. It is interesting to see the quality of his work in the field opposite Yealand School, which was completed on Monday. For this reason, in Yealand we will continue to use the mole plough as much as possible through the process, as funds allow. We are also grateful to various residents for the use of their mechanical diggers and staff, during the work. It is most appreciated. For those in Silverdale & Storth, the B4YS teams there are busy planning their routes, which is an important job that does take time. Updates from Silverdale & Storth will follow as soon as there is news. You may be aware that HRH Prince of Wales will be visiting the Westmorland Showfield at Crooklands, on Wednesday. His programme for the day will include a presentation of the B4RN Project. He will be introduced to the Project Management Team and will see demonstrations of the installation process. He will acknowledge the milestone of 1000 customers and the sale of one million shares! A fantastic achievement in a very short time! The next job is to cross the A6 – a job for a specialist contractor who will drill under the road – to complete the run of ducting. 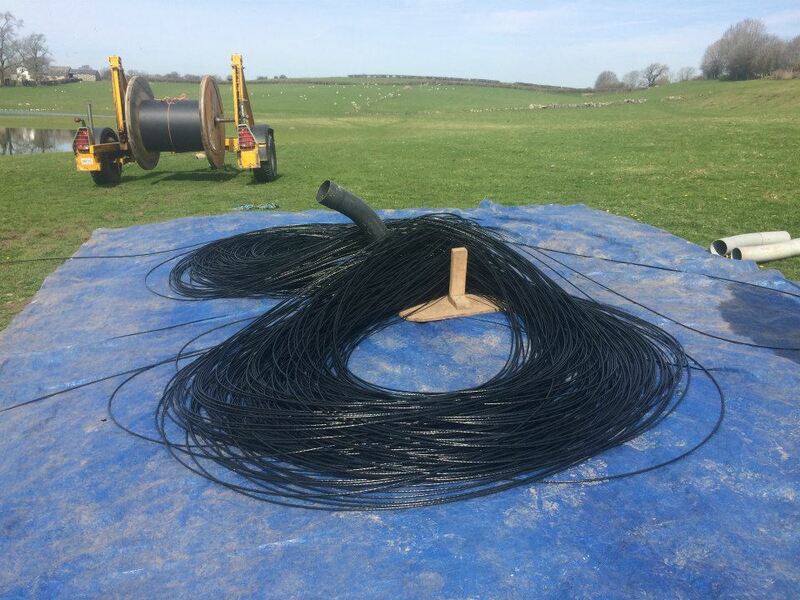 After that the fibre can be blown all the way from Borwick to Yealand, and the final connections at the village hall can be made. Amazing progress! Landowner digging: Some landowners prefer to lay the fibre across their land themselves, and earn shares too (see below*). 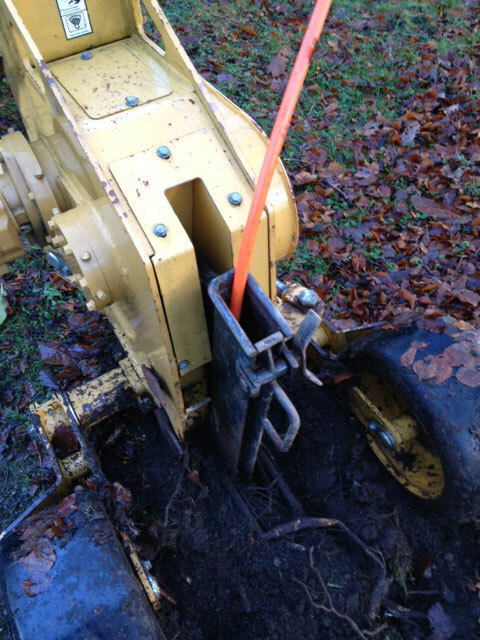 Contractor digging: used selectively where conditions and funds allow. Contractors will help us cross (or bore under) roads like the A6. 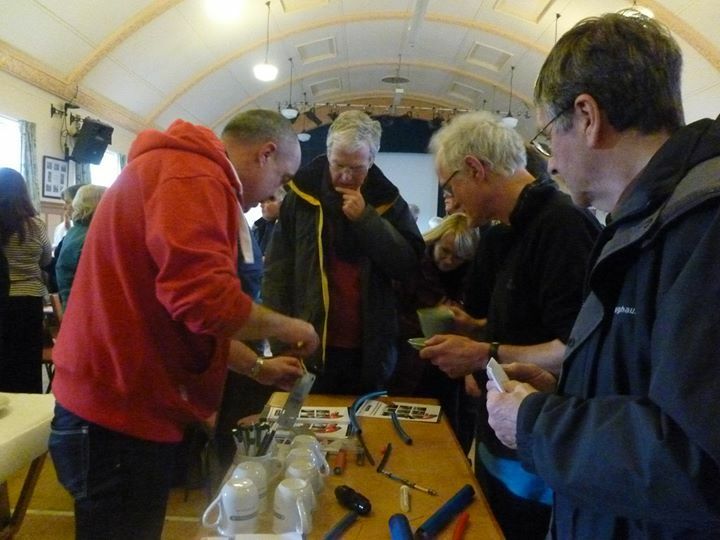 On Sunday 18th January we held our B4RN demonstration day at the neighbouring Priest Hutton & Borwick Village Hall. 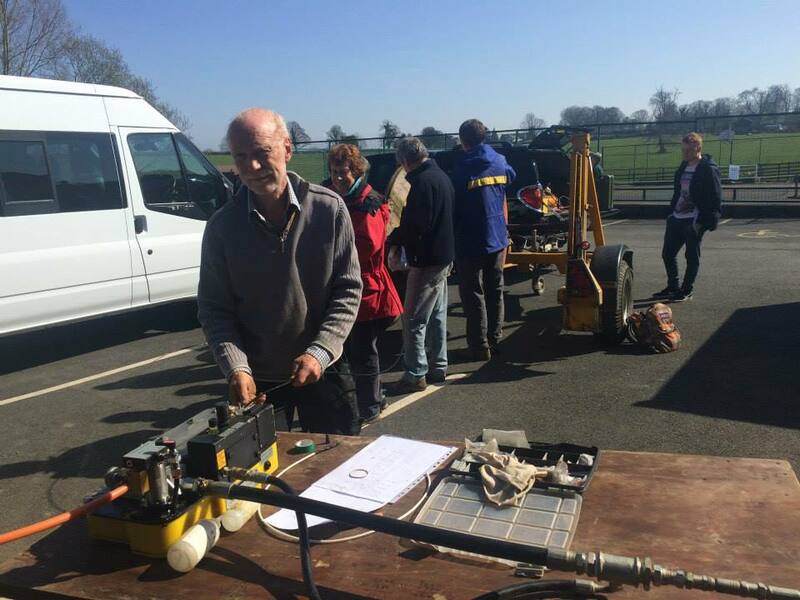 Priest Hutton & Borwick are already connected to B4RN – our B4YS connection joins onto theirs – so it was a great chance to get ‘hands on’ with a 1,000Mpbs internet connection. A first for many people! On the day we used one single B4RN connection, the same as you’ll get at home, and we connected over 120 devices over the 2-hour demo. During the day we had 4k HD video streaming from YouTube to Ubertech’s Macs and iPlayer streaming BBC HD to a TV, whilst everyone else was using the internet too, with NO BUFFERING! A fantastic turnout really showed us how much support there is in the B4YS area. We couldn’t have fitted more people (or cars!) at the hall! There was a surprising number of people from nearby areas wanting to bring B4RN their way. We even had visitors from from Surrey, Derbyshire and Yorkshire. How far will B4RN go? There are already 800 people connected…B4RN is aiming for 2000 by the end of the year! A very full car park! 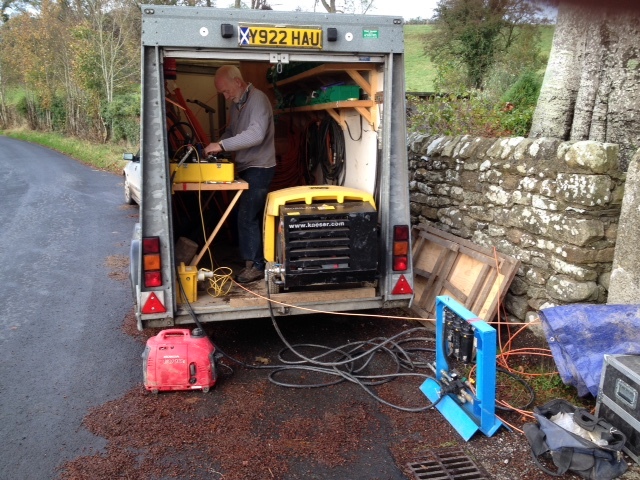 We had a busy day, this was after things had quitened down a bit! There are more pictures on the B4RN Facebook page. BBC Radio 4 interviewed Barry Forde – CEO of B4RN – on the popular ‘PM’ show recently. 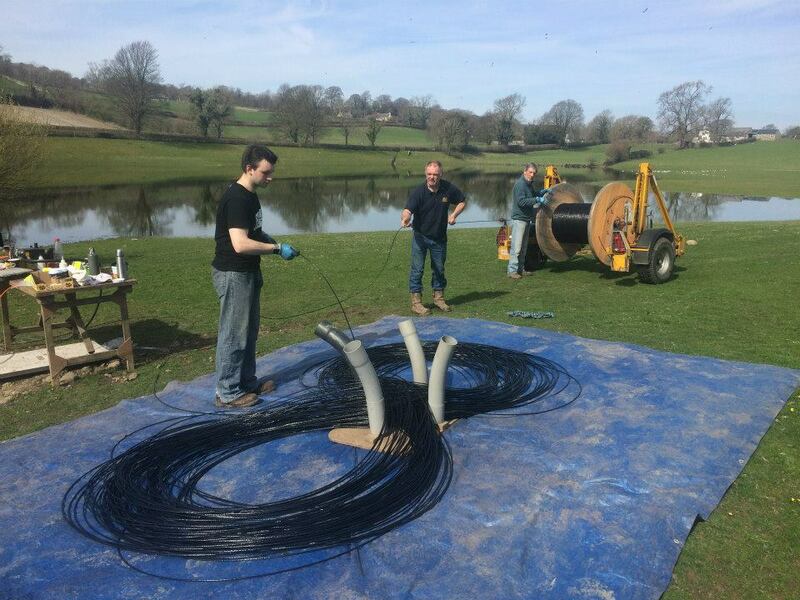 500km of fibre laid already, go B4RN! With our neighbours enjoying 1,000Mbps broadband just down the road, we thought it was time to experience it first-hand. We’ll have a range of devices for you to see & try. You should bring your own laptop, tablet or smartphone and connect it to the B4RN network too! Only the most modern and fastest devices can make the most of B4RN’s speed – Ubertechs shiny new iMac’s will be the speediest – whilst other devices may find their limits on the day. Generally speaking laptops can reach up to 600Mbs depending on specification; iPads will see 40-80Mbps whilst most smart phones are only capable of 20-40Mbps. Remember wired connections are usually much faster than Wi-Fi too. We will have some faster devices there to try. If it’s portable, bring it along! Smartphones, tablets, laptops, VOIP phones….anything, we’ll have both wireless and wired connections available. Don’t forget to bring your charger and internet cables! Re-familiarise yourself with connecting to a wireless network before you set off too, so you know where the settings can be found. If you have some big files to upload – photos or video to send – bring them along on a memory stick and do it on the day. Sunday will also be a ‘bring your own refreshments’ day, so do bring something to drink. Log on to speedtest.net (or install the app for iOS, Amazon, Android or Windows Phone). Run tests at home or in the office, making note of both the UPLOAD and DOWNLOAD speeds. Maybe try BBC iPlayer, YouTube and uploading photos & files too. See how your internet speed affects the experience. Can you watch in HD without buffering? Run these tests again at Borwick to see the B4RN difference! B4RN is one of the fastest connections in the UK, so when using Speedtest.net the server you select does make a difference. Some of them can’t cope with 1,000Mbps! There’ll be a bit of experimentation on the day, but we’re told servers in Manchester and Amsterdam can demonstrate the fastest speeds. We’ve begun! 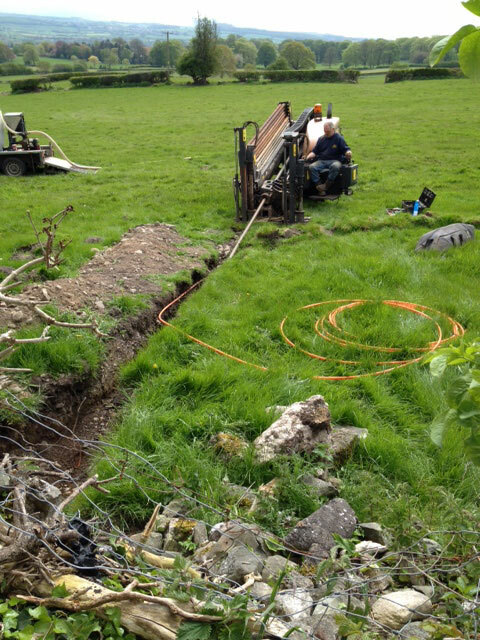 This week B4RN fibre ducts began going into the ground, heading towards the Yealands. The B4YS network is being built! B4YS breaks first soil – January 2015! The Yealands team have stormed ahead these last couple of months, and B4YS will begin digging early in January 2015. The tricky first route deals with the M6, the canal, the West Coast main rail line and the A6…all within a 4km stretch! Congratulations to the Yealands team who’ve worked so hard to plan the route and obtain permission from the landowners. Thank you to the landowners who have kindly supported us with free-of-charge access to their land, and thank you to our initial investors too; your cheques have gone towards buying the orange ducting and materials, which are now on standby. With our neighbours enjoying 1,000Mbps broadband just down the road, we thought it would be good to go and experience it first-hand. We’ll have a range of devices there for you to see & try. You can even bring your own laptop, tablet or smartphone and connect it to the B4RN network! Pop the date in your diary now, more details will follow in January. If you missed it first time around, this is a great video about the Bursary to help further develop the social enterprise that is B4RN. The B4RN network in the rural areas north east of Lancaster has made it the fastest city in the country and B4RN hasn’t even got there yet! 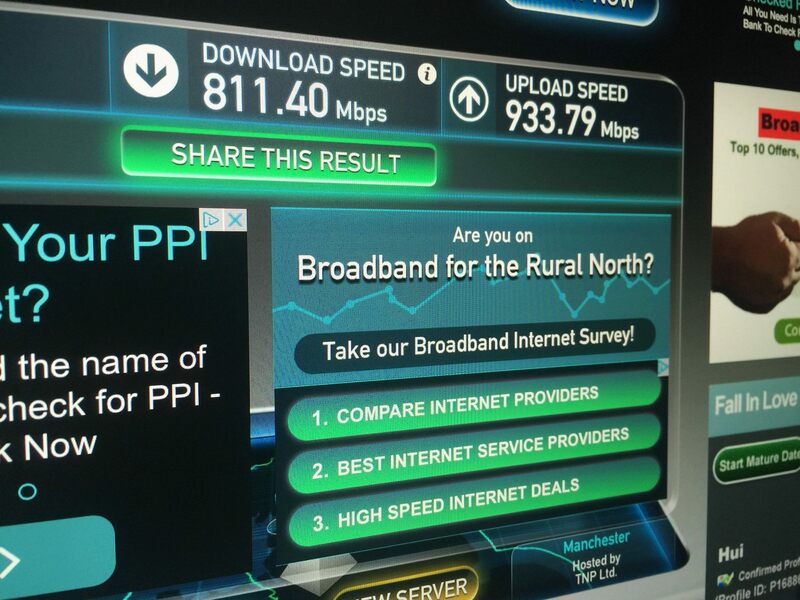 This is due to the amazing speeds we are getting on the B4RN fibre, it really pushes up the city average. Merry Christmas & see you in the New Year! In the last newsletter we let everyone know that our Stage One fundraising target had been met. That means that Hyperfast Broadband will be coming to our parishes, without a doubt. 19 other parishes are actively taking part in connecting themselves to B4RN, many are connected already. All before us have been able to overcome any difficulty put in their way – community power is amazing – and we’re no different, nothing should stop us now we have funding. We’ll be taking the B4RN batton soon, when we hook up to their link somewhere around the Longland’s Hotel area. Don’t assume you’ve automatically been registered – even if you’re on our mailing list, even if you’ve invested your hard-earned – we will need some extra information so we can identify your property for a connection, so please take the time to register (our registration form was first published 1st Sept 2014). We’re having a busy time here at B4YS – and there’s always great news to share – but I (Chris) have to admit I’ve been terrible at telling everyone about it these last couple of months. Taking feedback on board, I’m currently making arrangements for a new “head of communications” on the team, so that updates can be more frequent. Watch this space. So where’s the project up to? We’re hoping to have the Borwick to Yealand link committed to paper over the next month or so, and digging can begin soon after. With our neighbours enjoying 1,000Mbps broadband just down the road, we thought it would be good to go and experience it first-hand. “Try before you buy” if you would. We’re currently arranging a B4RN demo day for the middle/end of January and will publish details as soon as it’s confirmed. Contractor digging: these boys are the experts. Top of our roster is a man who knows the area well – he contracts for BT laying cables and laid our gas pipes in Silverdale – he’s also a regular contractor for other B4RN parishes. Contractors will help us cross (or bore under) roads like the A6. Q: How will we cross the A6, M6, canal and West Coast Railway Line? Multiple routes have been carefully planned, making use of bridges, farm underpasses and culverts to cleverly cross these obstacles without needing to involve the likes of Network Rail. This stage of planning is almost complete. Q: How will the fibre cross the fields? Q: How will the fibre cross roads? Crossing roads like this is expensive whilst fibre ducting is cheap, so if possible we plan slightly longer routes that avoid crossing roads and make use of culverts etc. Q: What about the limestone under the ground? We have a geologist on the B4YS team. We can use LIDAR maps – http://goo.gl/wBKlfj – to help us navigate the clints and grikes so the ducting can be burried in the soft stuff. 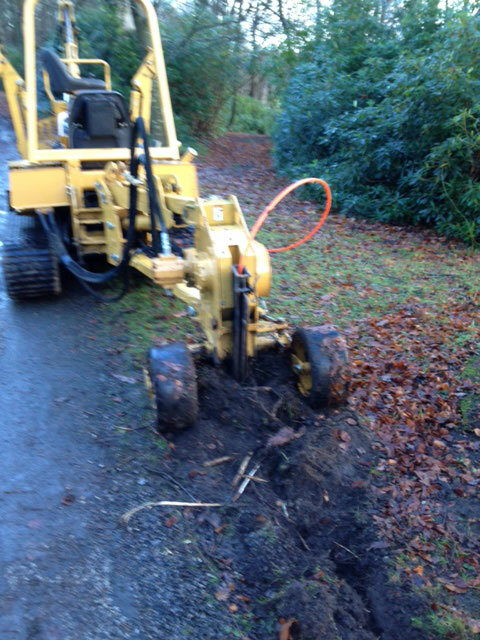 We have a pipe-laying contractor who laid the gas mains in Silverdale. He knows the land (and the limestone) well. Run the ducting at a shallower depth, and top it with paving stones for protection from spades etc. Run the ducting over land in steel or plastic pipe clipped to a wall or fence. Run the ducting overhead, using telegraph poles. As a last resort if we have to (and where we can do), there’s the rock trencher. These come in all sizes, big and small. We might not need the big one! Q: Will there be a definite start date for digging? There probably won’t be a definite date for anything. Amongst other unknowns this is a project run by volunteers, dependent on things like convenience to landowners, the weather, contractor availability etc., so it’s going to be quite fluid. We probably won’t know when digging can start until the week before when everything slots into place. Q: When will you be coming to my house? Good question. With so many variables and a volunteer workforce it’s difficult to say. We aim to begin digging in Yealand this year, then to Silverdale & Storth in spring. We will be connecting properties throughout 2015. Watch this space for updates! Q: Can my property/farm/business be connected? Yes. Every property that wishes to be connected, will be connected. Q: What is the cost for a B4RN connection? It’s £30/month. There’s a one-off connection fee of £150 to cover the cost of the engineer visit and modem. The connection is 1,000Mbps upload & download, and is unlimited in terms of data transfer. Q: Will you dig up my garden? 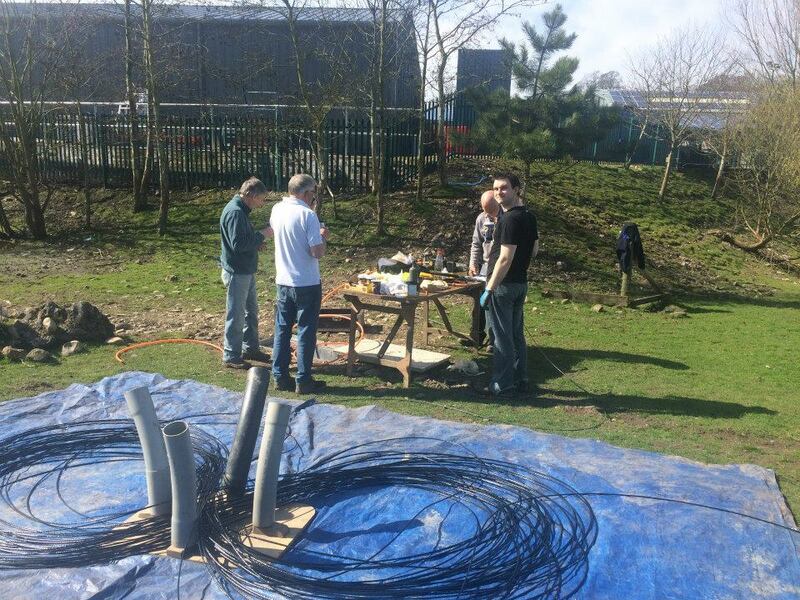 As a community project it will be the community that lay the fibre ducting. This may be you, your neighbour, or a contractor if you choose to employ one. 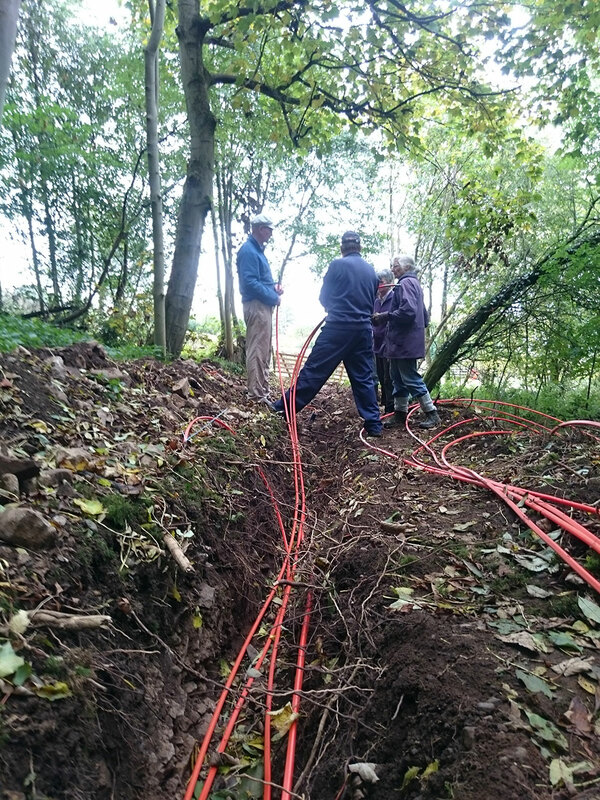 No digging will be done without consultation and remember, the fibre doesn’t necessarily need to go into the ground. It can be clipped to a wall or fence inside a pipe, slipped between paving flags. There are many options; the orange fibre duct to your property will be thinner than your little finger. Q: Will I have to change my email address when I move to B4RN? If you use an email address from your ISP you may lose this when you stop paying them (do check before you cancel it) but that’s true when you switch to any new provider. We suggest you register with one of the free web based services such as Gmail, Yahoo or Outlook Live (see http://free-email-services-review.toptenreviews.com). These can be configured to run with the email client on your computer (e.g. Outlook, Thunderbird) or can accessed through the web. Please make sure you notify B4RN & B4YS if you change email address, or notifications will be sent to your old one. Q: Will I need my BT line? A B4RN connection means you won’t need a BT telephone line. You can save money on both your line rental and your call charges by using a service such as Vonage. Vonage are a VOIP provider; they route your calls over the internet. You can keep your existing telephone number, your current handset, and make calls in exactly the same way – they’re just cheaper! 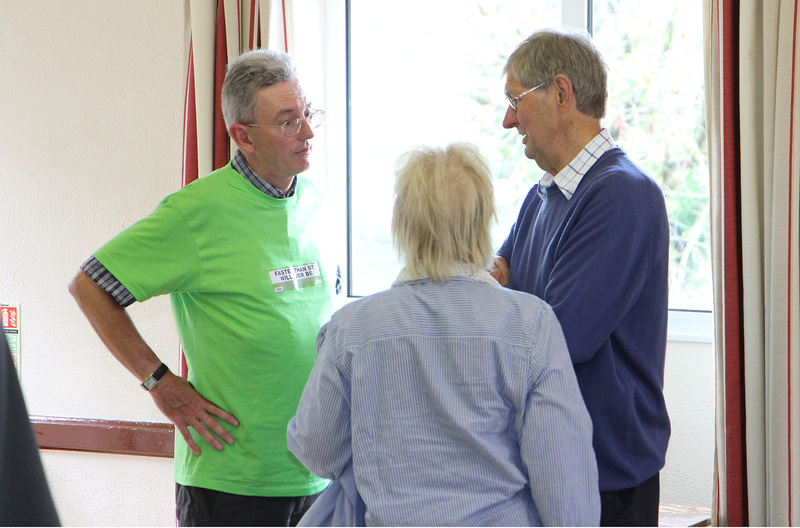 We need volunteers for all sorts – organising, canvassing, route planning, digging, technical etc. – so please let us know how you can help. We are building up our contacts list for future use, and will be contacting people from it as & when we need. Q: Can I still invest? The B4YS team are likely to be very busy over the coming months, preparing for the digging to begin. Don’t worry if news is a little quiet – that’s a good sign – but there will be at least one update before Christmas. In the meantime please continue to spread the word. 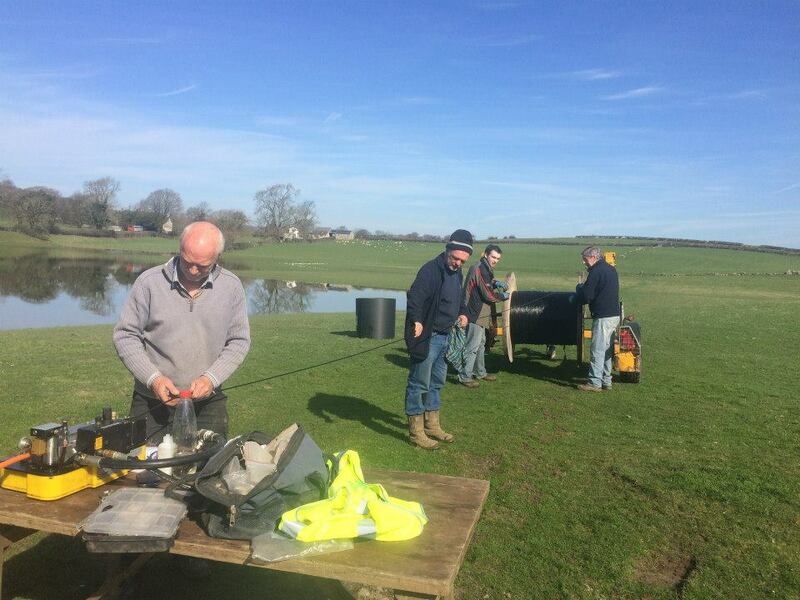 This project where many were sceptical is now happening in a field near you – well done everyone for supporting us. Thank you! Now we have reached the First Stage Investment threshold, the more detailed work is starting. We are planning routes now, so if you know of any rivers, culverts or dykes that go under roads near you (please have a look if you are walking the dog…) could you kindly let us know? Any local knowledge, contacts, advice & help will be gratefully received. Again, please let us know. Please also tell your neighbours to register their interest if they want to be included. It’s much easier to register & plan now, rather than later! This email is to bring you the great news that all three B4YS villages have reached their Stage One targets! Yealands – target: £25,000 – current level: 100% raised! 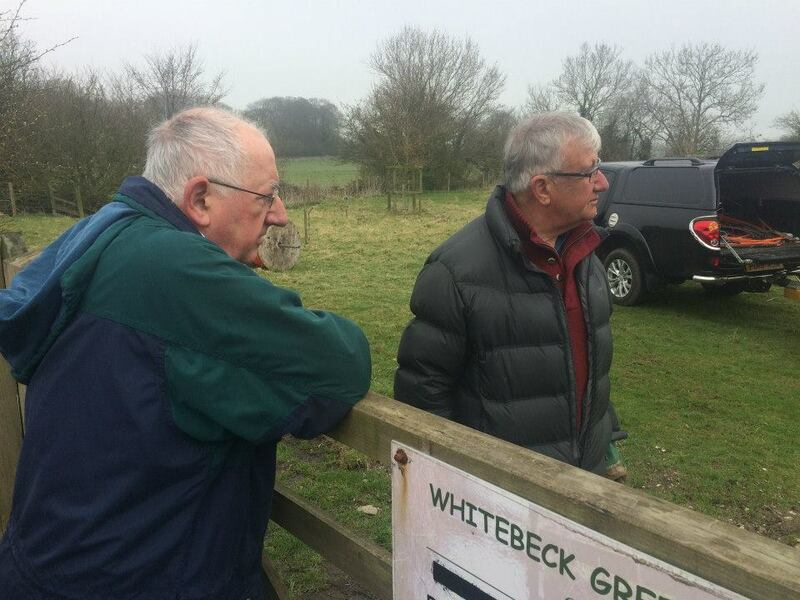 Silverdale – target: £38,000 – current level: 100% raised! Storth – target: £38,000 – current level: 100% raised! That’s an amazing £101,000 raised from local residents and businesses – it means that our community-owned Gigabit fibre broadband network will go-ahead. We will have one of the world’s fastest broadband connections in our parishes…homes, farms, businesses…everywhere. Every property can be connected. Stage Two fundraising continues (we’re already making a good dent). We notify all investors of the date that cheques will be cashed. We present our funds to B4RN, which allows our project to begin. B4RN issue receipt documents including Form EIS3, allowing UK taxpayers to reclaim 30% Enterprise Investment Scheme (EIS) tax relief. We finalise our route between the village halls and check we have permission from landowners. 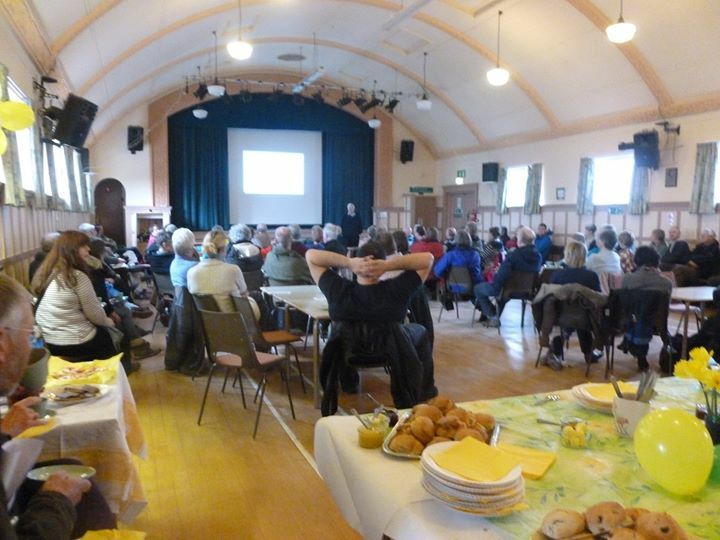 B4RN prepare a detailed plan for our parishes, encompassing all farms, houses and businesses who wish to be connected. The plan includes a final cost for our project; including Stage Two (this is roughly similar to Stage One). The Stage One funds are used to buy materials & equipment for our network. It’s important to note that the figure we’ve reached this week is our Stage One target (which builds the links between the village halls), and there is a second stage to come (the internal parish routes). Other B4RN projects have found that Stage Two roughly equates to Stage One, but each parish is different, governed by the number of properties to be connected and how long their Stage One route was. We’ll find out our exact Stage Two targets from B4RN soon and keep you updated. Stage Two fundraising starts today so please continue to invest, don’t delay, we’ve still got a way to go! Now that the project will definitely go ahead, we will forward share forms & cheques to B4RN on a fortnightly or monthly basis, rather than holding them back until we reach the next target. This means your shares can start earning a return straight away. Each step towards the Stage Two target means the network can spread further. The B4YS network will be built by the community. Why? Because the national providers won’t do it for our rural communities – we have to do this ourselves! This is just what our neighbours have done to get their fibre, we can do it too. Fill out the form below to tell us how you can help. 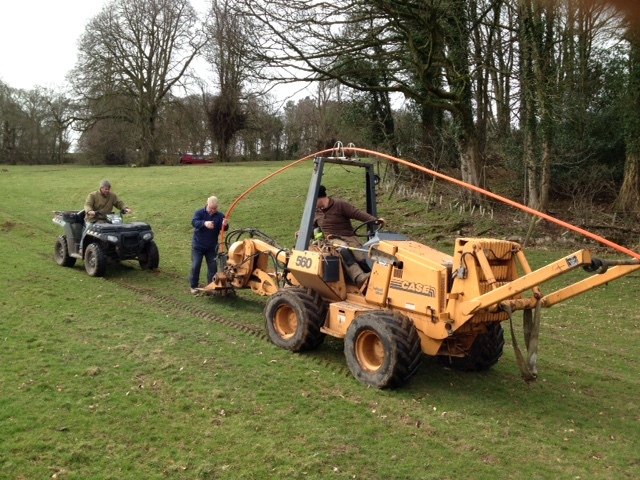 If you have a digger or can pull a mole plough, you have just become our new best friend! A 1,000Mbps internet connection really is coming to Yealand, Storth & Silverdale, but we need to know where demand is to help us plan & prioritise the network. Filling out this form is not binding and does not commit you to an order, but please only register if you are sure. A B4RN connection costs £30/month inc. VAT. There is a connection fee of £150 to cover the cost of the new router, unless you are a shareholder investing over £1,500 (then the fee is waived). A connection means you won’t need a BT landline. You can use a VOIP service like Vonage to route your calls over the internet to get cheaper calls. Hyperfast broadband can work out cheaper per month than your current slow connection! The B4YS team are likely to be very busy over the coming months, preparing for the digging to begin. Don’t worry if news is a little quiet – that’s a good sign. Since our public meetings on 2nd August in Yealands & Storth, the B4YS team have been very busy. The community support for the project has been amazing, and is increasing all the time! Yealands – target: £25,000 – current level: 55% raised! Silverdale – target: £38,000 – current level: 68% raised! The B4YS project works as a whole, and collectively we are 77% there! It’s clear to see the project is gaining momentum. Investment cheques are arriving daily as people see that this really can happen. The B4YS project will go ahead – thank you everyone for your continued support! What happens as we reach our Stage One targets? It’s important to note that the figures above are our Stage One targets (which builds the links between the village halls), and there is a second stage to come (the internal parish routes). The plan includes a final cost for our project, including Stage Two (this is roughly similar to Stage One). Storth is at 100%. Does this mean I can’t invest? Not at all, no one will miss the boat. Stage Two fundraising starts as soon as Stage One is complete and for Storth, that means today. In Storth your support will be allocated to Stage Two so please continue to invest, don’t delay, we’ve still got a way to go! Other B4RN projects have found that Stage Two ROUGHLY equates to stage one, but each parish is different, governed by the number of properties to be connected and how long their Stage One route was. The stage two plan including every property requires a LOT of work (and is done by volunteers) so B4RN understandably don’t begin this process until we have shown we are able to raise enough support. We’ll find out our exact Stage Two targets from B4RN once stage one has been met. 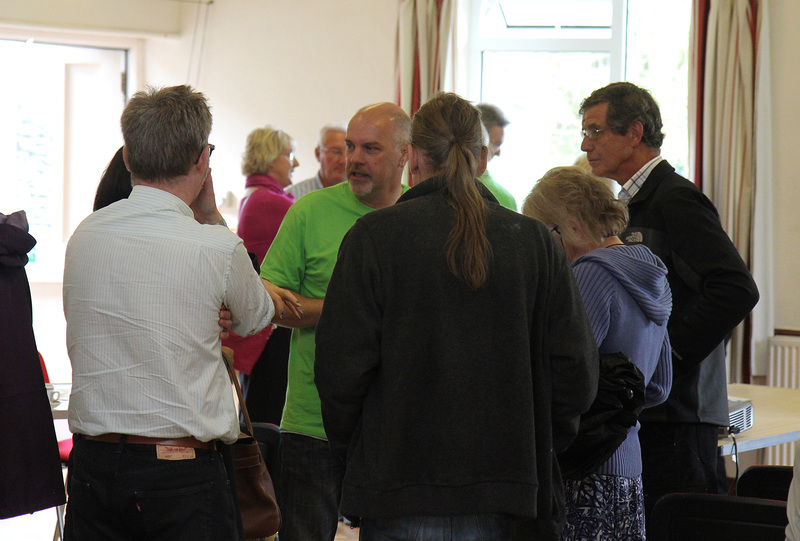 A big thanks to everyone who came and showed support at our public meetings on Sat 2nd August. The turnout and support was excellent, which is very promising for the project! If you couldn’t make the meetings or wish to listen again, there are slides and an audio recording here. If you missed our public meetings in Storth & Yealands on Saturday 2nd August, don’t worry, we recorded it for you! 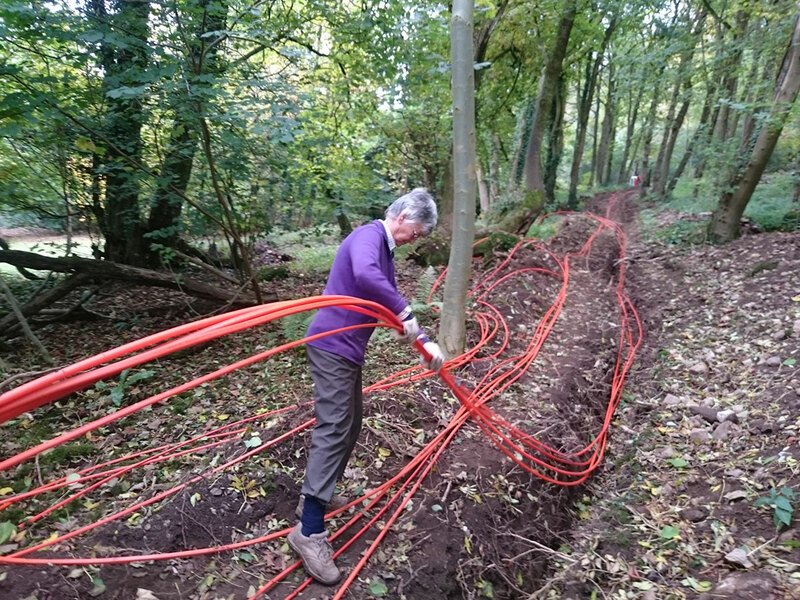 Barry Forde (CEO of B4RN) gave a fascinating talk, and answers all the questions you’re likely to have about how a community builds its own fibre optic broadband network. You can listen online by clicking play below, or download the MP3 file by clicking here. Thanks to everyone who came along. Click here for photos of the day. Hyperfast Broadband will provide all our news, television, film, music and communications in the future. It will be an essential service in education, healthcare, farming, tourism and business and will connect families and communities. It will also increase the value of your property. 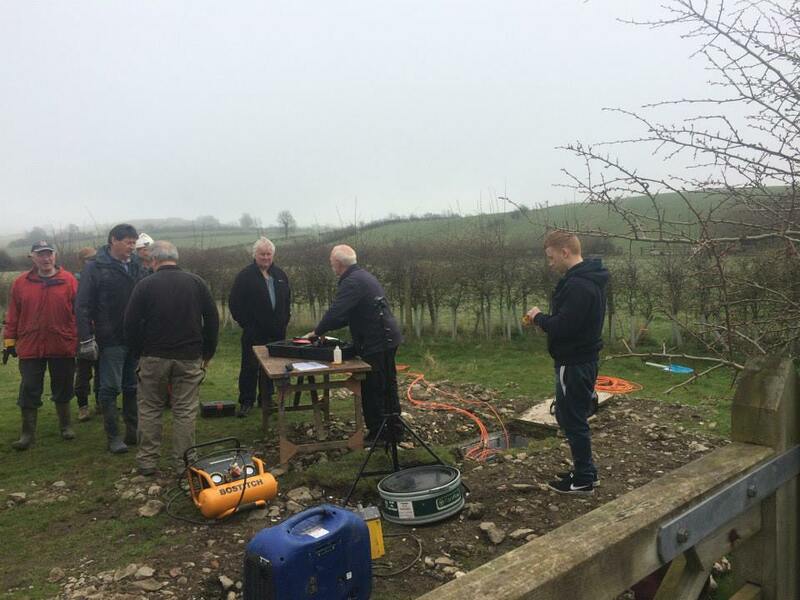 The B4YS project will lay a network of fibre optic cable through the villages, which can be directly connected to every property. It will deliver a broadband service equal to the very best anywhere in the country, and will be adequate for all foreseeable uses – truly a once in a generation opportunity. In order to progress this development we now need to talk face-to-face with members of our community, to tell you how the project will develop and seek your support. The meeting is organised by the B4YS Group. 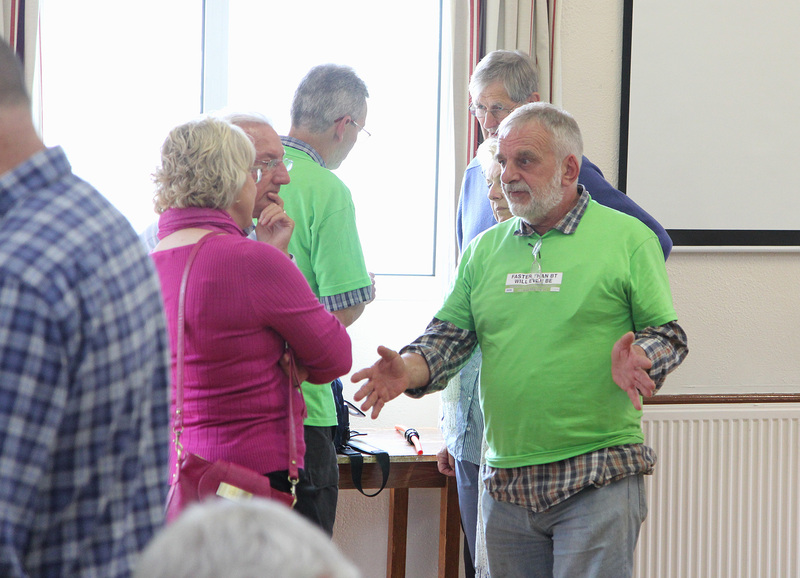 It will be similar to the Silverdale meeting in March, starting with a presentation by Barry Forde (Chief Executive of B4RN) followed by the opportunity to ask questions. We look forward to seeing you there. B4RN and the inspiring Christine Conder were featured in The Economist recently, well worth a read. FUSION splicing is a technique network engineers use to string together optical fibres. It is not a skill that Christine Conder, a 60-year-old farmer’s wife, ever expected to learn. But with borrowed tools and a little training most people can pick up the basics. “It’s only like knitting,” she says. For taxpayers, share purchases up to £20,000 are eligible for 30% EIS relief. Businesses (and those who don’t pay tax) should consider lending money to the project. B4YS have reproduced a localised copy of the B4RN share form. If you wish to invest for the benefit of the Yealands, Silverdale or Storth, please use the B4YS form and return it to your local parish representative. This means we can monitor support for each parish and keep you informed. Unless you wish otherwise, B4YS will securely hold onto your forms & cheques until your parish is ready to proceed. This means that in the unlikely event that the project does not go ahead, your cheques can be returned. 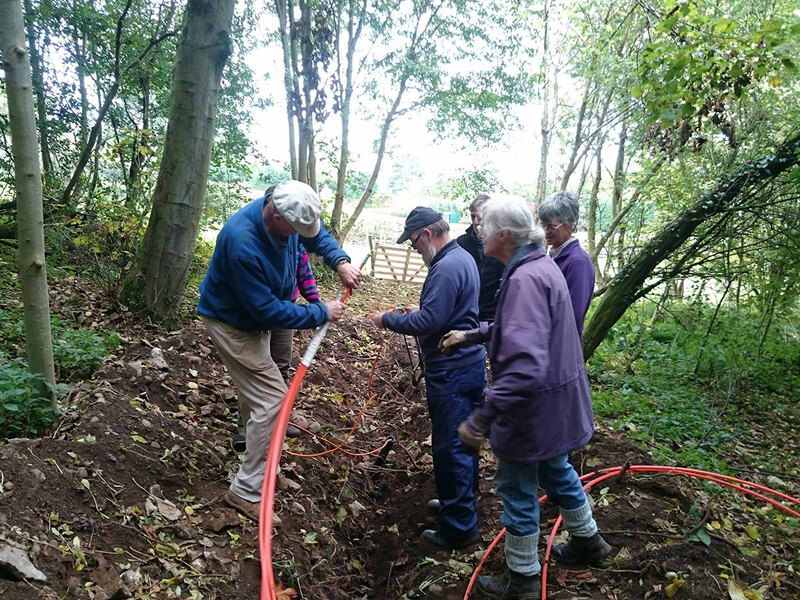 Many have expressed an interest in getting up close and personal to the digging & duct laying may be interested in helping out our neighbouring parishes. 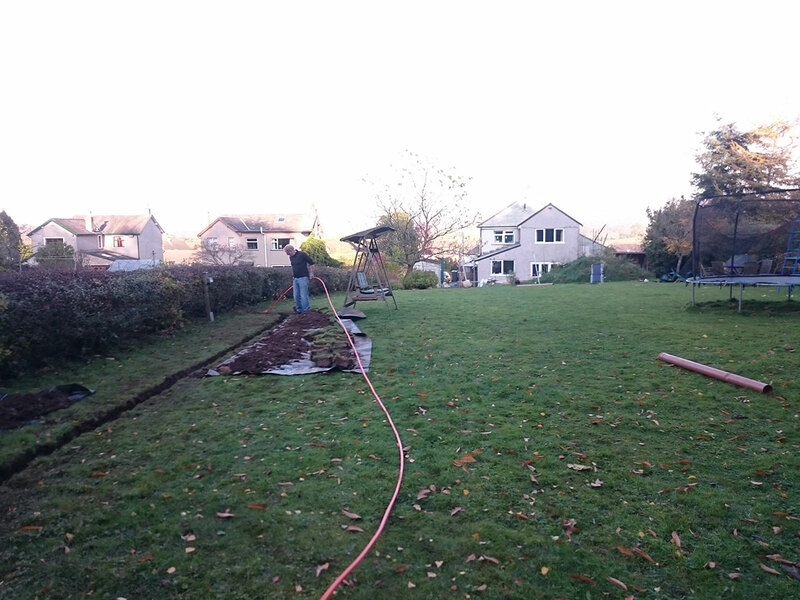 Aughton, who have already bought their fibre, are presently engaged in the spade and shovel work. It’s a great opportunity to see what will happen once we’ve bought our fibre for B4YS. South Lakes MP Tim Farron has called on local residents in Storth to look at a proposal by Broadband for the Rural North (B4RN) to move out from their base in Lancashire and bring superfast broadband to the Cumbrian village of Storth. B4RN is a “not for profit” Community Benefit Society. It has been established by people living in Bowland and the Lune Valley, with the aim of installing a fibre optic superfast broadband network. It will be available to every property in our area; with no exclusions because a property is too far away or too difficult to reach. B4RN plan to connect the villages of Yealand Conyers, Yealand Redmayne and Silverdale, scheduled for the later phases of the project and will consider coming over the border into Cumbria if there is sufficient demand and the community is prepared to fund the project through share purchase and help to install the fibre cables. Tim is asking local residents if they are interested in the scheme. If enough interest is recorded the service could ‘come online’ within the next 2 years. 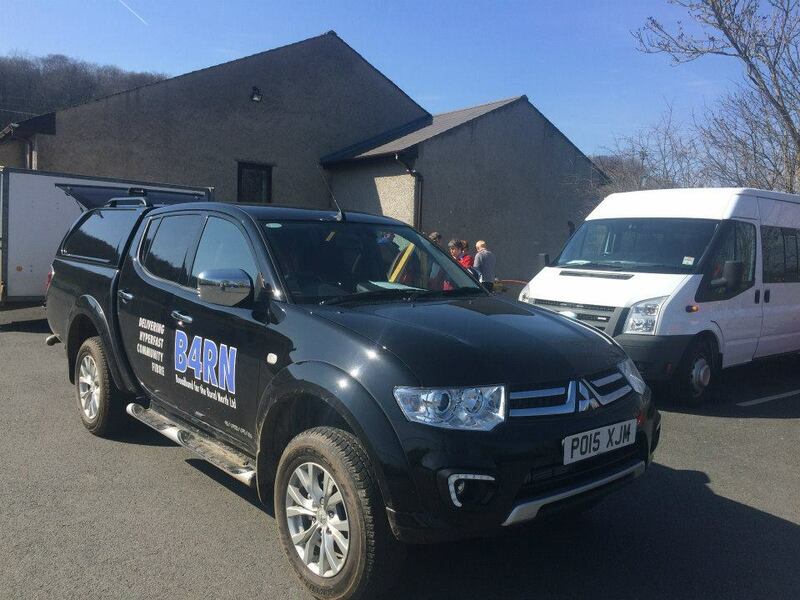 B4RN are hoping to connect around 1,400 commercial and residential properties under Phase 1 of the project in north Lancashire. Work on the network got underway at the end of March. @cyberdoyle In what sense? Do I still support B4RN? Yes I do. @cyberdoyle Glad to see Storth in there. I’d be happy to help them in any way I possibly can. If you’ve seen our planned route, you’ll have noticed it starts at Borwick. 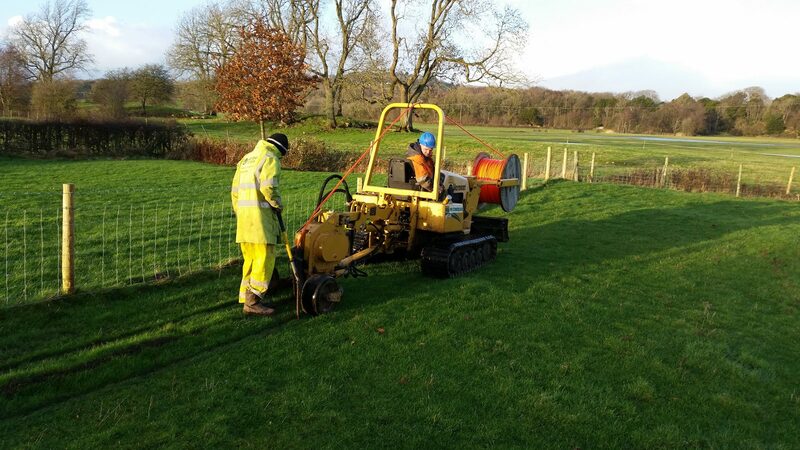 We’ll be continuing the 1Gbps fibre broadband connection from though Yealand, to Silverdale & Storth. The team at Borwick started their B4RN project some time before B4YS began, but you see below that they’re well on their way. The B4RN model works – communities doing it for themselves – and it’s coming to a village near you! With growing numbers of people going online to perform tasks ranging from work to grocery shopping and streaming entertainment, good broadband has become critical. Homes without can lose 20 % of their value. We can have world-leading broadband speeds in our rural homes, schools, farms, businesses and future. The 3rd Show-Tell day was very well attended and feedback from delegates was very good. The weather was kind to the group as they were taken on a tour of the areas where the B4RN team are deploying. Pictures of the event can be seen on the Facebook page here. The date has been set for the next Show-Tell day and this will be 9th April 2014. Full details are below. Click on the image to download the PDF. Please register for attendance by emailing info@emtelle.com. You we be sent further details regarding the full agenda and location. 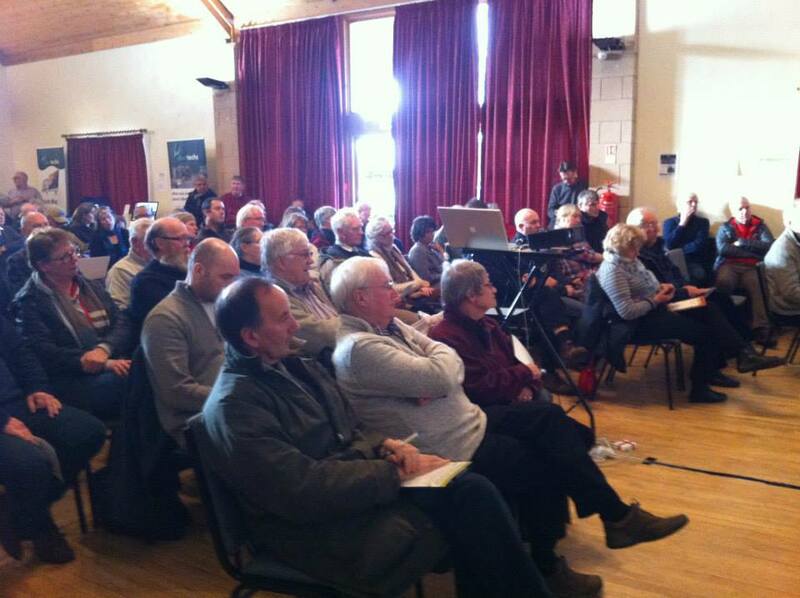 A group of rural Cornwall residents are campaigning to be introduced to fibre optic broadband. 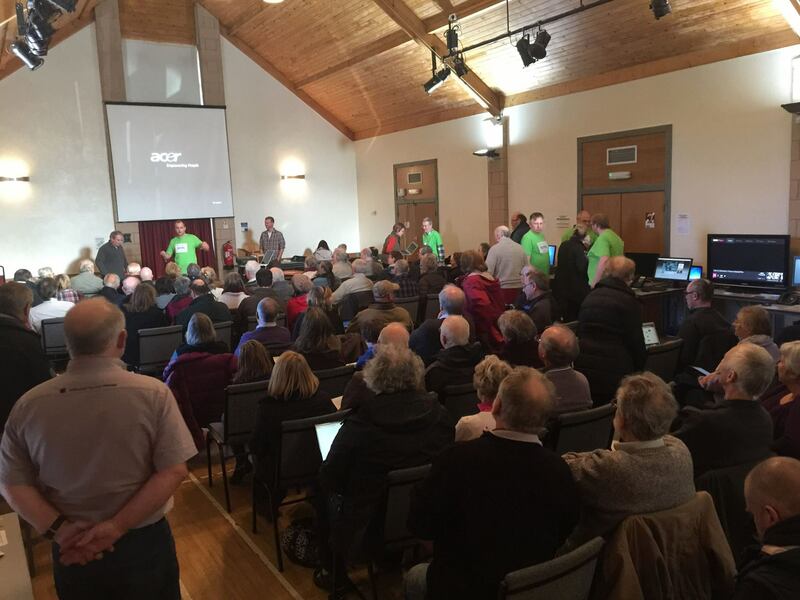 Homeowners from a rural area of Cornwall have launched a petition to try to bring superfast broadband access to their properties. The region is covered by the Superfast Cornwall rollout project, which has been bringing the next-generation service to properties as part of the government’s Broadband Delivery UK scheme, reports the Cornwall Guardian. However, the civil parish of St Kew and other nearby areas such as Trequite have been excluded from initial installations because they are not deemed to be commercially viable by service provider BT. A petition has now been set up by local residents Alex and Bella Nicolas, who have become concerned about how much the poor quality of their existing broadband connection is hindering their daily lives. Once the Superfast Cornwall project is completed, it is estimated around 80 per cent of the region will have access to fibre optic broadband. 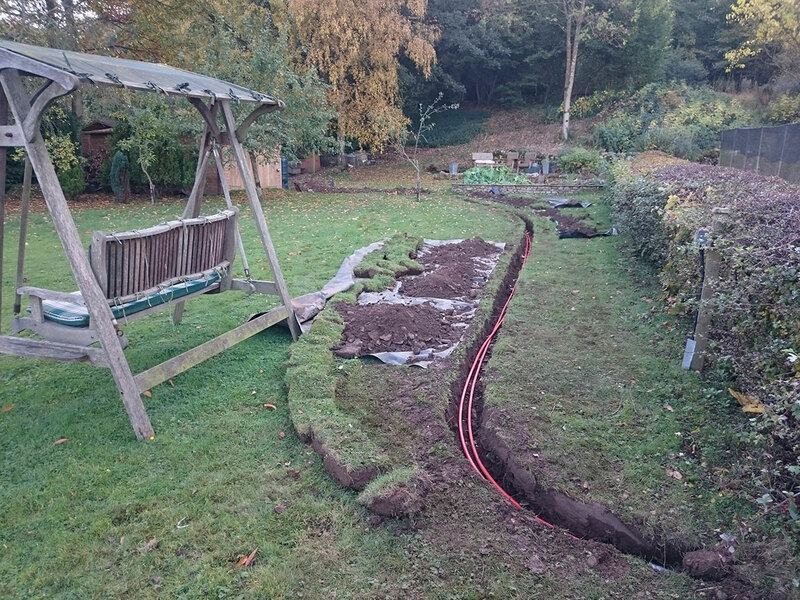 Work commenced on getting Wray connected back in July 2013, with work temporarily impeded by thetheft of cabling equipment in late December.